Product Description: Pocket size universal AC/DC voltage tester. 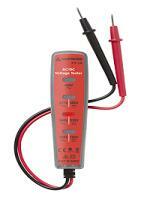 Quickly test the presence and level of the voltage or for unenergized circuits. The PY-1A Voltage Tester's light bulb with light up when the circuit test is completed!